At our May meeting on East High Athletics in the 1960s, “Biz” Johnson gave attendees an update on the “Raise the Curtain” campaign to renovate the Madison East High school theater. Volunteers are helping East High School to raise $3.5 million to restore and renovate the theater by 2012, the 90th anniversary of the school. The original theater, designed by Frank Riley to be consistent with the dignity of the façade, was a handsome and inspiring gathering place for Madison’s east side. Not just a place for students, it has welcomed the community to musical and dramatic performances, award ceremonies, and gatherings like the East Side History Club’s May programs in 2010 and 2011. 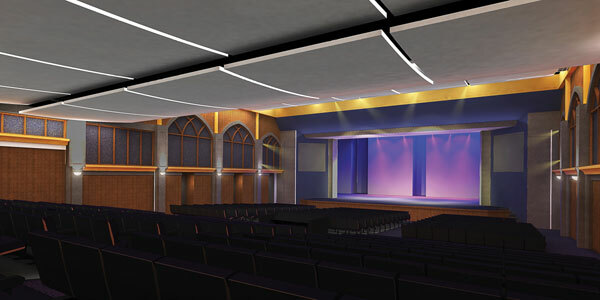 Renovations over the decades reduced the theater’s size to provide more classrooms, and updated the furnishings to school-style desk-seats–with unfortunate consequences for the comfort of event-goers. Anyone who has attended a performance in the theater in recent years knows that the Raise the Curtain Campaign seeks to fill an undeniable need. Visit the campaign website to see an inspiring video about the theater and plans for its renovation. To make your donation or discuss a planned gift, visit the website or contact campaign organizers at info@easthightheater.org. This entry was posted on June 6, 2011 at 2:23 pm	and is filed under Uncategorized. You can follow any responses to this entry through the RSS 2.0 feed. You can leave a response, or trackback from your own site.